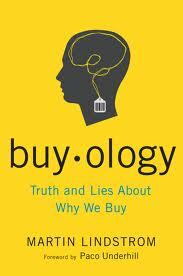 This book = an amazing blend of science and marketing. If you’ve ever wondered why you purchase some of the things you do (for me it’s the iphone) then you need to read this book. Martin’s research centers on something called neuromarketing, which means he is doing brain scans (functional magnetic resonance imaging) to figure out if and why people actually do like/buy/try a product or service. The reason? Martin says the most market research is ultimately flawed is because people are poor at reporting their own actions. For example one of his studies was on reality tv. Asking people if they would watch it the show again proved a poor test, most said no. The scanning however, told a different story. He was able to accurately predict which of the reality shows would be a big success based on the scans. Martin believes that traditional research methods like asking customers why they buy only gives you a tiny insight. If you’re slightly paranoid and have a bit of a ‘big brother is watching’ type belief then I would NOT recommend this book! Some of this stuff is scary! Particularly from an ethical viewpoint, and, as with most tools, this brain-scanning type of research could definitely be used for good or evil! One of my favourite parts of the book fcosues on branding and how much emotion plays a part in the choices we make. I think this chapter very close to the truest words I’ve seen on branding which is this: everything is perceptual. Want more? Grab the book here.